Frame bright nickel finish with clear lacquer protection. Foam cushion attaches to seat with Velcro. n the 1960s, Warren Platner transformed steel wire into a sculptural furniture collection, creating what is now considered a design icon of the modern era. Vertical steel wire rods welded to circular horizontal and edge forming rods. Moulded fibreglass shell and foam cushion; cushion attaches to seat with Velcro. Available in a variety of fabrics. Bright nickel finish with clear lacquer protection or painted bronze metallic. 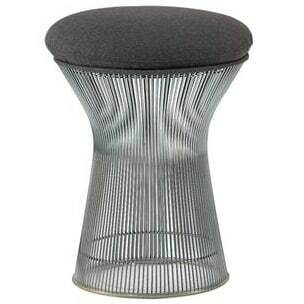 Do you have a question about "Platner Stool"? How can we contact you?